If given the chance, most practical homeowners will elect to have the best dual flush toilet installed in the bathroom. It is not hard to understand why! After all, a dual flush toilet can give them substantial savings. A dual flush toilet has two buttons or handles for flushing solid and liquid waste. A half flush, in particular, uses a lower amount of water for moving liquid waste or urine. A full flush may also be chosen by the user to move solid waste. I know how hard it’s to pick the best dual flush toilet as the market is saturated with dozens of brands and hundreds of models. I have spent countless hours to analyze some of the top rated dual flush toilets and built this list. These are the best models available on the market that won’t let you go down. American Standard Siphonicdual flush toilet is not only water efficient, but is also comfortable for most users especially seniors and tall people.Its rim stands about 16.5 inches off the ground, which makes it higher than most standard toilets. This makes it a lot easier for people get on and off the seat. We liked that it is elongated and thus more comfortable to sit on than round toilets. It is quiet when flushing. The tank refills very quickly, too. And a bidet can be added to it. But the installation isn’t really easy no thanks to its horrible installation guide. This KOHLER K-3988-0 Toilet can let you save on water bills without sacrificing flushing power.A half flush uses about 1.1 gallon water, while a full flush uses the standard 1.6 gallons of water per flush. The dual flush level is placed on the side of the tank, so you can put things like deodorizer or toilet paper on top of the tank. With this toilet, you save up to 4,000 gallons of water every year. It is ideal for tall people and those with knee issues as the rim is about 18 inches off the ground. The tank refills quickly, too. One negative side, It is difficult to install. EAGO TB222 Dual Flush toilet uses just 0.8 gallons per flush in removing liquid waste.But for moving solid waste, it gives a generous 1.6 gallons per flush so that you won’t have to worry about your waste going back up. EAGO TB222 Dual Flush toilet also has a powerful and efficient 3 inch flushing vale and a wide water surface area for ease in cleaning and odor control. We appreciate its soft close toilet seat and lid which is included in the package. It has a powerful flush for moving solid waste, but economical when moving liquid waste. But it is a bit short with its rim about 14 inches off the ground. Flushing can be a bit sluggish as well. TOTO CST744SG#01 has a SanaGloss glaze that keeps the toilet bowl clean with every flush.It also has a wide 3-inch flush valve aside from being equipped with TOTO’s patented G-Max flushing system. It is easy to install as you can follow the clear instructions given. It is very economical in water use, using around 1.5 gallons for the full flush. Its SanaGloss glaze keeps the toilet bowl clean. The flush is very quiet as well. But the top of the tank doesn’t fit well. Moreover the SanaGloss will get damaged by hard water. American Standard Siphonic Dual Flush two-piece toilet uses around 1 gallon of water for a half flush and the standard 1.6 gallons for the full flush.There’s a two button actuator located on top of the top, which you simply press to choose the water saving flush you desire. American Standard Siphonic Dual Flush Toilet has an antimicrobial surface that is designed to deter the growth of stain, bacteria, mold, and mildew. Its rim is about 15 inches off the ground, perfect for smaller people. But a seat is not included, as it is sold separately. It’s a bit noisy when flushing, too. Euroto Luxury Toilet Elongated is a one-piece is easy to clean.It has a high spiral flush frequency designed to break down waste, even paper. It also has a sleek and slim design that makes it a good choice for smaller bathrooms. Its rim is about 16 inches off the ground. This toilet helps minimize water consumption with its dual flush technology. Its high spiral flush frequency helps in breaking down solid waste. Its sleek and slim design makes it ideal for small bathrooms. But it is very heavy so you would need help in installing it. Moreover, it is one of the more expensive in this list. You can add a bidet seat to this Ellegantz Genie elongated toilet if you wish an alternative to toilet paper when cleaning yourself after doing your business.And its bidet has separate nozzles for cleaning the posterior and feminine area. Ellegantz Genie elongated toilet has a soft close lid thus you won’t need to worry again about other people slamming on the toilet lid. Its bidet seat presents a hygienic way of cleaning yourself after doing your business.It has dual retractable self cleaning nozzles. And its bidet has separate spray jets for feminine area and posterior. However the bidet seat does not fit round toilet bowls. Installation is quite confusing/difficult too. EAGO TB351 Dual Flush one-piece toilet is so economical when it comes to water utilization.It can only use 0.8 gallons per flush for moving urine. But when moving solid waste, it makes use of the standard 1.6 gallons per flush so you can be assured that everything you drop on the bowl will be removed. EAGO TB351 Dual Flush one-piece toilet has a wide water surface, too, that can minimize the odor and make cleaning of the bowl easy. The soft closing lid and seat are included in the toilet. The elongated toilet seat design makes it comfortable to sit on it. It can remove liquid waste without using much water. It is a one-piece toilet that is easy to clean. But the plastic mounts are cheap/weak. The mounting instructions are vague/incorrect too. TOTO CST412MF.01 Aquia is another two-piece toilet that has dual flush system, and an elongated front bowl.It can help you to reduce your water consumption as it only uses 0.9 gallons for a half flush, although it uses 1.6 gallons per flush in moving solid waste. Its dual flush option can be activated by pressing a Chrome push-button. I like that it is very economical in the use of water as its low flush option only uses 0.8 gallons. Half flush and full flush can be activated by pressing a well designed Chrome push button. The elongated front bowl seat is comfortable to sit on for most people.The rim height is about 17 inches from the ground, comfortable and easy to get off/on for most people. KOHLER K-3987-96 Wellworth round front bowl toilet is a good choice if you are looking for a flush toilet that would fit in your small bathroom.The flush toilet lets you choose between 1.1 gallon on every flush or 1.6 gallons. The dual flush lever it has is placed on the side of the tank thus the top of the tank can be used for storage. I like that it is not noisy when flushing. The tank is quick to refill water. The dual flush lever is located on the side of the tank, so you can use the top of the tan for storage. It uses minimal amount of water for its half flush. But installation is a bit hard. The round front bowl toilet is not as comfortable as elongated toilets. The two piece design means you’ll have to work harder in cleaning the toilet. 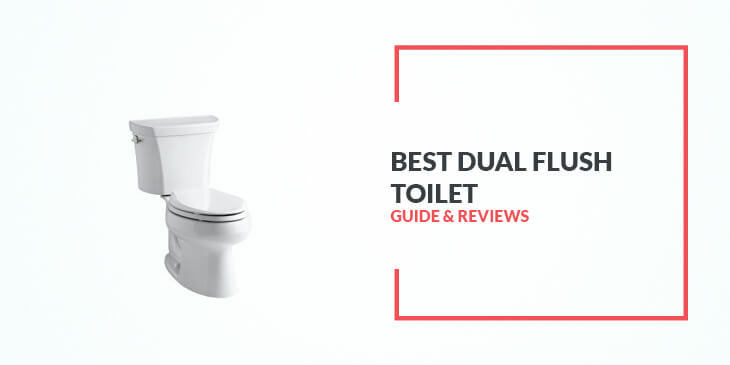 Buying the best dual flush toilet isn’t easy. You need to consider some factors. You can choose between a one piece or two piece toilet bowl. The one piece toilet bowl is easier to clean, and is a smart choice for your small bathrooms. But it can be very expensive. Choose between a round or an elongated front bowl. The round toilet seat is not as comfortable as the elongated toilet seat, though. Since you are looking at dual flush toilets, it is already a given that you will be able to save lots of water. But you don’t want to compromise on flushing power as well because the last thing you want to happen is to deal with solid waste that won’t go down the drain. If you can get a dual flush toilet that accommodates bidet seat, the better. Bidet toilet seats are deemed to be a hygienic choice for most households.